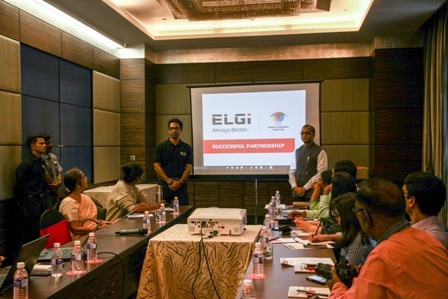 Elgi Equipments has announced the outcome of its successful partnership with Indian Texpreneurs Federation (ITF). ELGi’s air audit program helped ITF member companies to reduce average compressed air energy costs upto 43%. ITF is a 500 member strong organization covering all textile operations concentrated in Tamil Nadu. ITF’s mandate is to promote the textile sector. Its 500 members collaborate in an environment of confidentiality and mutual respect to share best practices to improve the industry’s operational standards. Externally, the group’s leadership partners with the government to raise awareness of challenges facing the industry. Given rising energy costs, textile units are exploring opportunities to reduce the cost of compressed air. To support the textile industry’s focus on energy reduction, ELGi partnered with the Indian Texpreneurs Federation (ITF) to design a comprehensive energy program. The program included information sessions for owners and general managers on the compressed air best practices, practical training sessions for textile maintenance engineers, and critically, free of cost air audit programs that helped recognize significant cost savings. An Air Audit is a review of an operation’s use of compressed air. The audit evaluates both the generation and distribution of compressed air. A review of generation evaluates the compressor’s performance compared to original specifications, energy consumption, current condition, and appropriateness for the application. A review of the distribution evaluates how compressed air is used in the plant, which includes leaks in the air lines and general consumption. Compressed air systems are dynamic and inefficiencies develop over time owing to air leaks and changes in air consumption. An air audit assesses a compressed air system and identifies areas of inefficiency with corresponding cost savings if rectified. An engineer presents a detailed report with recommendations on how to recognize the potential savings. The technical training sessions with textile maintenance engineers help instill compressed air best practices which enable engineers to sustain efficiency. The ELGi-ITF air audit program across 130 textile customers recognized annual savings of Rs. 14 Cr. with an average compressed air energy cost reduction of 43%. ELGi will continue its engagement program. ELGi recently announced the launch of Air Alert, a free of cost sim based data transmission service that will monitor a compressors critical parameters to ensure optimum energy consumption and compressor failure prevention. ELGi has committed to 500 Air Alert equipped machines by the end of December, 2017 and to date, 21 ITF customers have been Air Alert equipped. On Air Alert, Anvar Jay Varadaraj said, “Air Alert will complement our energy program with ITF. Specifically, an Air Alert equipped customer can rest assured that changes in their energy consumption post an air audit will be detected by ELGi’s Air Alert service and reported immediately for rectification”.